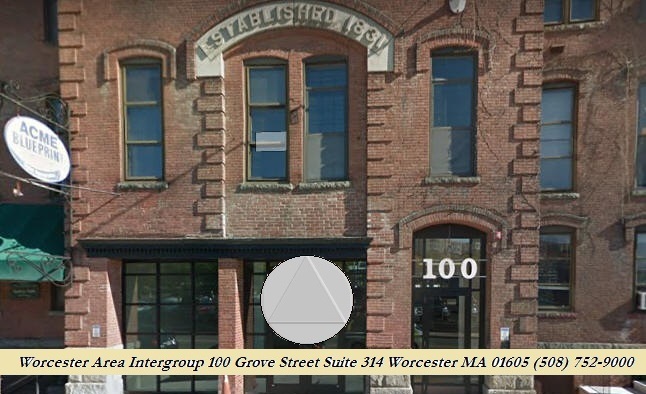 Worcester Area Intergroup (WAI) is an Alcoholics Anonymous (AA) intergroup that serves AA groups in central Massachusetts and the metro west area. For WAI office hours: click here. For driving directions: click here. Online donations are also welcome —Click here to donate online. Individual AA members and groups can also support WAI on a regular basis via its "Faithful Fivers" program. WAI is overseen by two committees, a Steering Committee and a Delegates Committee, which together comprise the membership of WAI. Both committees meet on the 2nd Thursday of each month. All interested A.A.s and AA group delegates are invited and encouraged to attend the monthly WAI committee meetings (for directions: click here). The Steering Committee—the officers of WAI—consists of a chairperson, secretary, treasurer and their alternates, the office manager, and four trustees. The Steering Committee oversees the daily operations and finances of WAI. The Delegates Committee consists of those delegates from local AA groups that are present at the meeting. The Delegates Committee votes on all matters beyond the scope of the Steering Committee. WAI service committee chairpersons and trusted servants give reports and share their concerns at the delegates committee meeting. 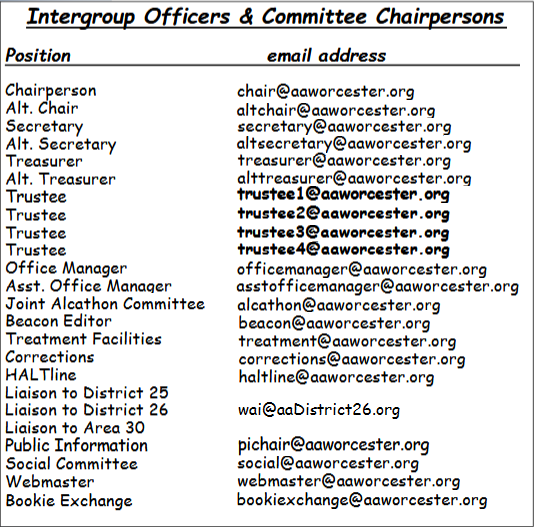 Intergroup officer, staff, and service positions with email links are listed below. For further details on the formal composition and operations of WAI, see the document WAI Guidelines. In North America, the AA service structure is often depicted as an "inverted triangle." At the bottom are two corporate entities: A.A. World Services Inc. (AAWS) and A.A. Grapevine Inc (GV), which are governed by a General Service Board which in turn is governed by area delegates voting at the General Service Conference. Geographically, North America is partitioned into Regions, which are further divided into Areas, which in turn are divided into Districts and within each district – at the top of the triangle – are the A.A. groups. 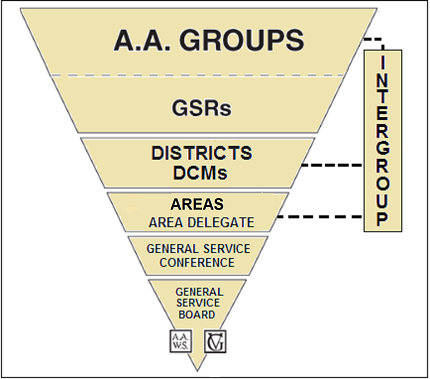 An A.A. Intergroup (or Central Office) is a committee or organization that exists to serve the local A.A. community. Intergroups often provide a 24-hour telephone hotline, an office where A.A. meeting lists, literature, and materials are available, and service committees and resources to support AA's primary purpose. Intergroups and central offices have existed since the early days of A.A. and operate outside A.A.’s general service structure. Many intergroups are nonprofit entities that are governed by charters or bylaws and elected officers and delegates and may employ paid staff members. An intergroup committee is mainly composed of delegates from local AA groups. Each AA group may elect a delegate to represent their group at intergroup committee meetings. A delegate is an A.A. group’s link to the intergroup committee, equivalent to General Service Reps (GSRs) that serve as a group's link to the district committee and area assemblies. Similarly, a district committee may have an intergroup representative, or Intergroup Liaison, to serve as a conduit between the district committee and local intergroup. An intergroup committee may also have an Area Liaison to represent the intergroup at area assemblies and area committee meetings. 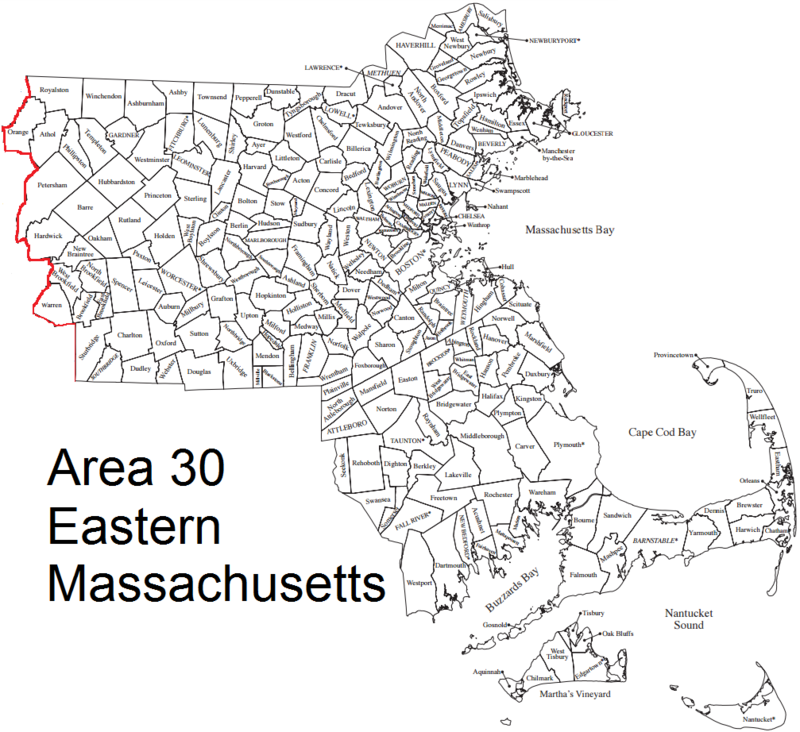 In Massachusetts there are two AA areas: Eastern Massachusetts (Area 30) and Western Massachusetts (Area 31). 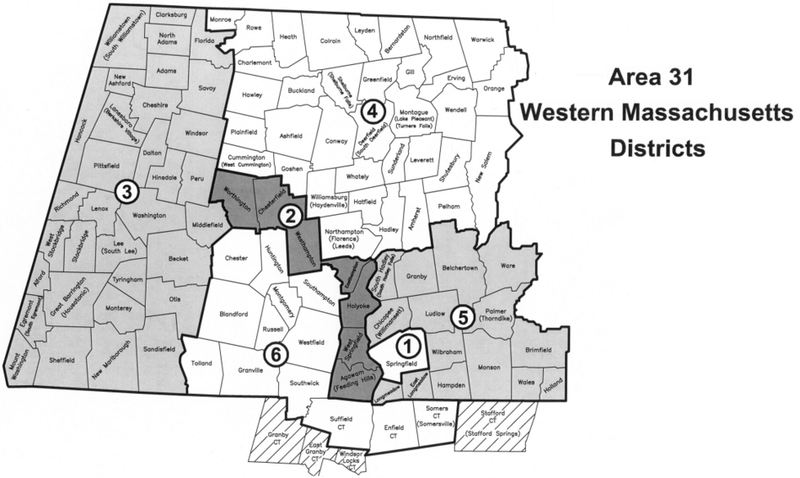 In addition to WAI, Massachusetts has an Eastern Massachusetts Central Service Office in Boston and a Western Massachusetts Intergroup Office in Holyoke, a Berkshire Intergroup Office, a Cape Cod Intergroup Office, a Martha's Vineyard Intergroup, and a Nantucket Intergroup.